I had the blessing and privilege to serve as a “buddy” this spring at Capernaum club, a Young Life Ministry for kids with special needs. I very much admire the amazing people who pour themselves into this ministry, most of them volunteers. They are clearly there for no other reason than to serve the kids, demonstrating the love of Jesus by feeding them, holding them, making them smile and teaching them the Gospel of Grace. There were so many beautiful characteristics about each of the kids I met. One completely refreshing quality of the kids in this group is that they are so openly and honestly and plainly just…themselves. I could go on and on about each and every one of them, but what I really want to focus on is how they affected me the most. 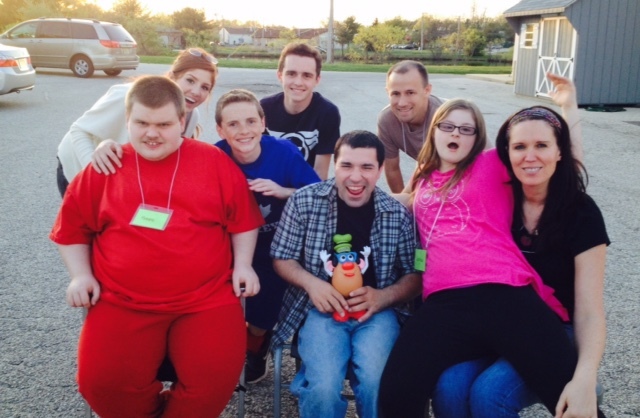 The Capernaum kids really know what it means to encourage and edify! Since becoming engaged with the contagious, encouraging spirit of my new Capernaum friends and thinking about God’s clear instruction, I’ve been trying to make a conscious effort to be encouraging to others and choose positive words for my family even when I just really don’t feel like it! Hi Katie god to hear from you. Your new group is adorable i know they just love you.